Can you pull one off? I was thinking Futaba MA's maybe, but then I found this post from last Summer that seems to mention it: viewtopic.php?f=2&t=10405&start=2730 it apparently has some sort of linear switch Edit: i am a dummy that was your post haha. Still looking for an answer huh? Most likely proprietary spring over membrane. Very quiet, but also kind of squishy in my experience. …unless there's another model with an entirely different switch design. Sadly I only have this tiny picture of it and no picture of the other side. I just noticed that it's at least pre-Windows key and has some strange tiling above the arrow keys. That's an HP Rubber dome board. I think that's an HP rubber dome, they made Alps boards with the same profile on some laptops but I don't recall any full sized ones; get the seller to photograph the underside if you can. Thanks for the update, I have access to almost the same keyboard but I was hesitant to buy it. It looks like it was taken from an old laptop. Laptops from Mitsubishi and Toshiba were in that colour scheme, but I think Toshiba's had Alps switches. Mitsubishi had small function keys like that. Oh, and Dolch's luggable computers had also that colour scheme but I've not seen that exact layout. Same color scheme than Bondwell keyboards with Cherry navy blue switches. Very interesting. Main keyboard: It changes daily! Main mouse: Logitech G700s; trackballs go home! Never seen one of these before. Looks rather plastic-y underneath the caps, so I'm assuming it's nothing good. Last edited by Keybug on 06 Feb 2019, 18:21, edited 1 time in total. Golly, that was quick, I was still busy editing the post... Thanks, Myoth!! The DEC LK201 is not rubber dome, but some kind of low-travel leaf spring on membrane. I've heard it that it would feel worse than rubber dome. The successor, DEC LK401 is rubber dome though, and mushy. I have a DEC LK201. I can confirm that it's a spring on membrane. It feels interesting, but not great. It's fairly scratchy and rough. It gets worse toward the edge of the key press, but doesn't quite bind. The space bar is pretty nice though, oddly enough. * A LED in the Up-Arrow key. 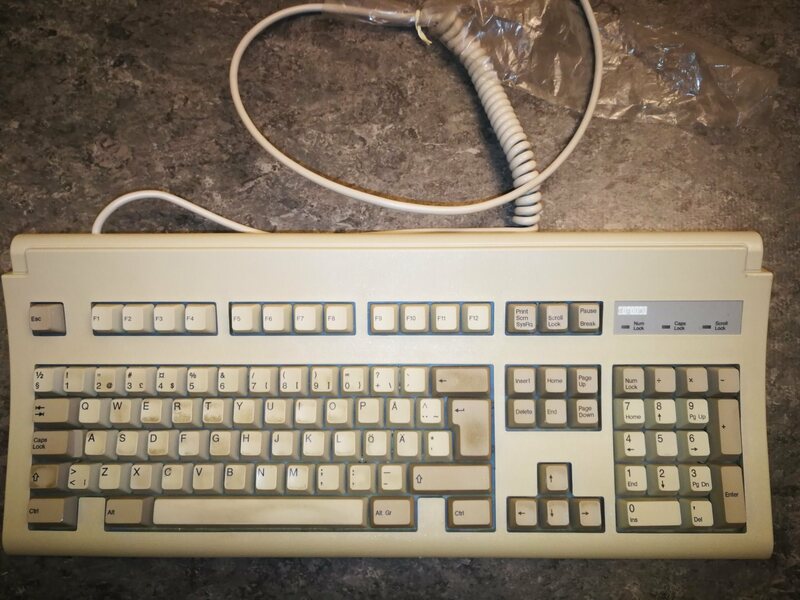 The label says it's "programmable" but I have no idea how -- unless programmable with the old Omnikey utilities, and I don't even know if that programming will hold once you boot this keyboard with either Windows or Linux. 1. How (other than the old Omnikey utilities floppy, or Soarer's converter which I already know) do you program this? Is there any kine of key-sequence you can use to program the behavior or certain keys (like on the ultra-plus)? What can you do with the programming? 2. When does the LED under the Up-Arrow light up? Again, I suspect this might have been an indicator light to show that some programming had been done with the Omnikey utilities, but I'd love any extra info anyone might have. I'd be very grateful if anyone could confirm / deny / instruct. This probably isn't the right thread, but I'm not one to nitpick about that. Any idea about this thing? (Digital PCXAL-MA) According to the FCC ID it was made by Keytronic in 1996, but it doesn't look like any Keytronic i've come across. (If anything it looks more like a derivative of the DEC LK401. Hehe, guess i was to focused on the Keytronic bit, guess its a rubber dome board just like the LK401 in that case. Wonder if its using the same type or Keytronic domes though, as i do kinda like the later. (Edit) after comparing it a bit more, i'm pretty sure its actually an Ergoforce, but in the case of an LK401 and with digital's branding. Wonder how that came about. The outside housing tells you it's a wiki/Four-tab_clone -- getting more specific probably involves opening it up. "Louder and clickier" makes it sound like wiki/Hua-Jie_AK_series is a possibility, but there may be many others.